The foal born at UC Davis on February 23 via intracytoplasmic sperm injection (ICSI). 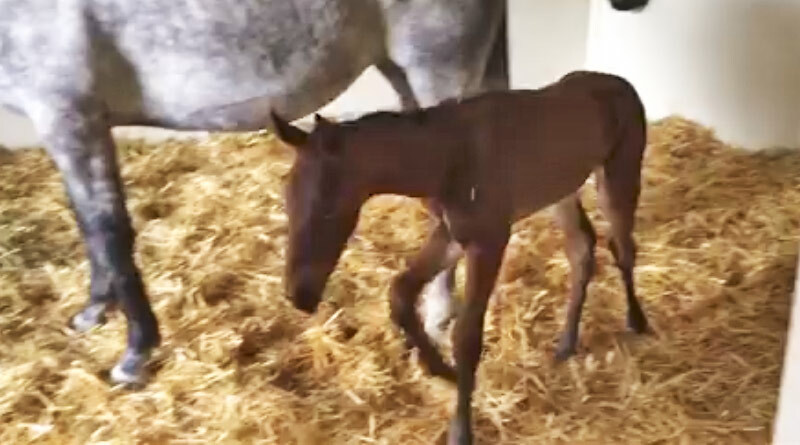 Equine reproductive researchers in the US have produced a foal born using intracytoplasmic sperm injection (ICSI), a first for the University of California, Davis. The unique laboratory-based fertilization process resulted in a filly born on February 23 at UC Davis’s Center for Equine Health. Both mare and foal are doing well. The surrogate mum is a six-year-old Oldenburg mare. Unlike the normal process of lab-based fertilization, which generally doesn’t work with horses, ICSI involves injecting a single sperm into an egg extracted from a mare. The embryo then develops in a lab for a week before being implanted in the mare. Previously, the UC Davis veterinary hospital’s Equine Reproduction Service had obtained a pregnancy by aspirating eggs from a client mare, shipping the eggs to Texas A&M University for ICSI, and bringing the embryo back to Davis for transfer and pregnancy. That foal was born in 2015. “This is the first all-UC Davis ICSI pregnancy and the result of a great team effort among veterinary scientists and clinicians,” said Dr Stuart Meyers, a veterinary theriogenologist leading the research effort. The goal of UC Davis being a one-stop shop for the ICSI procedure is two-fold, Meyers said. The first is to keep California horse breeders in the state, which lowers the risk to mares and minimizes expense to the owners. Secondly, researchers can get an idea of the mechanism of embryonic loss to better predict success. In horses, clinicians typically report significant embryonic death when trying to produce viable horse embryos. Only about 30 percent of follicles have eggs that are harvestable; only 50 percent of those will mature for sperm injection. Of those eggs injected with sperm, only about 20 to 30 percent survive as full-term foals – creating staggering economic and emotional loss to horse owners. Meyers said the researchers at UC Davis can monitor every cell division of the embryo and get a good idea of what is happening with each stage of embryo development. Meyers is seeking industry partners to further this research and establish a new program for advanced equine reproduction to more fully understand the biology of horse embryos and pregnancies in general. “We envision being able to provide total reproductive health care from embryo production to birth and beyond,” he said.